We know the routine. You have a desktop, and a laptop, or perhaps two laptops. You want your files in both places. 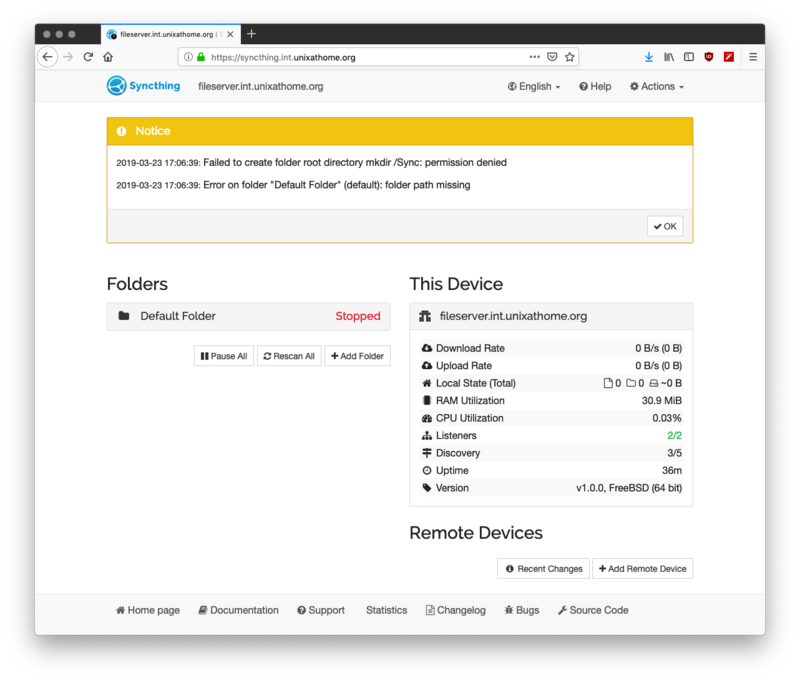 A shared, remotely mounted directory is not ideal. Instead, let’s have the systems synchronize themselves. 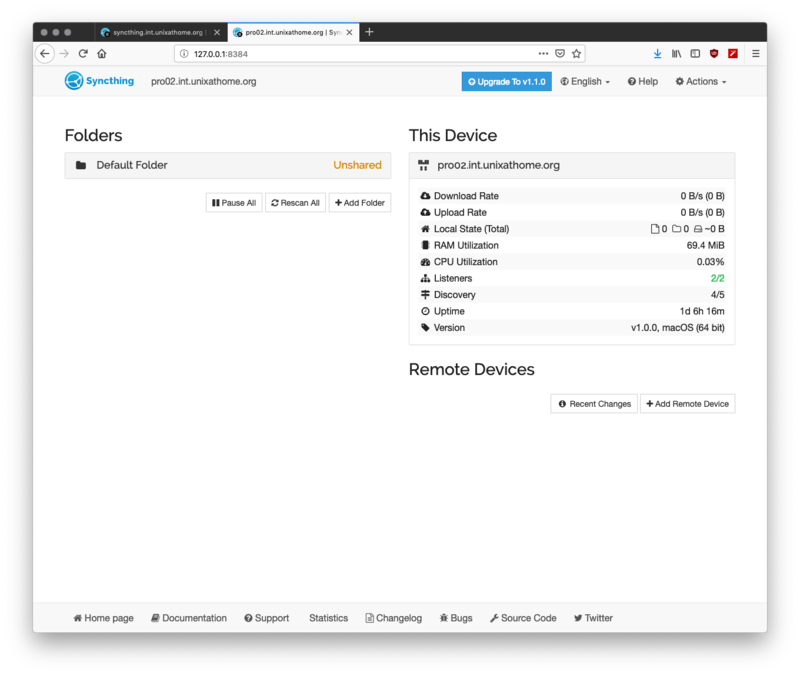 I decided to install syncthing within an existing jail, called fileserver. Why? I attribute that to the port evolving, but I really do not know. I installed via pkg install syncthing, and I had already built it on my poudriere server. When I tried to browse to 10.0.0.1:8384 I got a ‘check host error’ which is documented. I am sure this can be fixed by other solutions, but I installed Nginx and create a reverse proxy, which is outside scope for this blog post, but see https://docs.syncthing.net/users/reverseproxy.html. 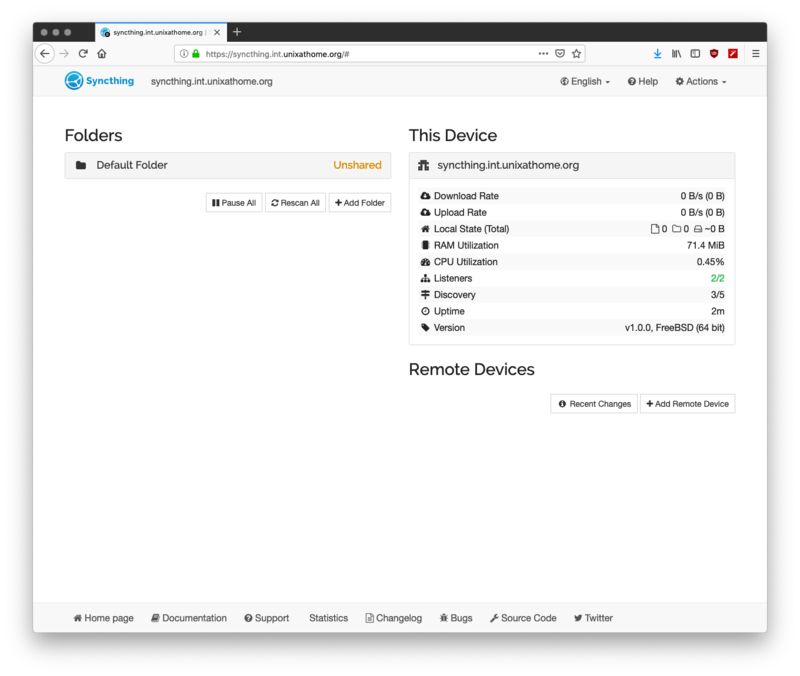 Not shown here, is my creation of a Let’s Encrypt certificate, and configuration of anvil to pull the cert down from my distribution server. 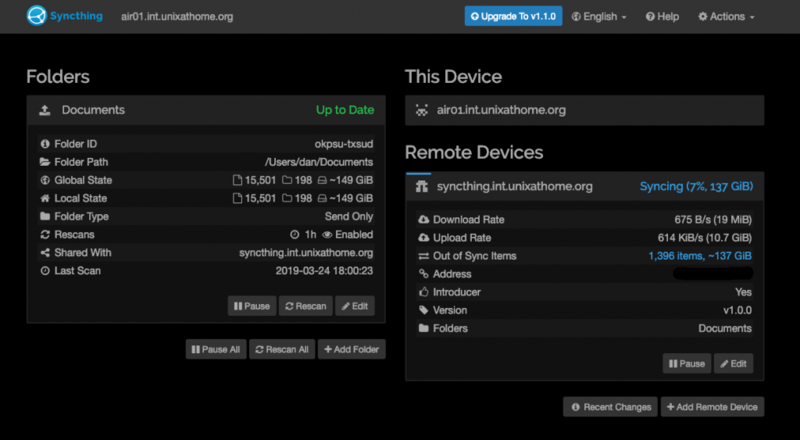 I also created an entry in DNS for syncthing.int.unixathome.org which has the same IP address as fileserver.int.unixathome.org. My first step, seeing as this server runs ZFS, I will create a dedicated filesystem for syncthing and mount it within this jail. I adjusted the directory permissions so that only syncthing had access. 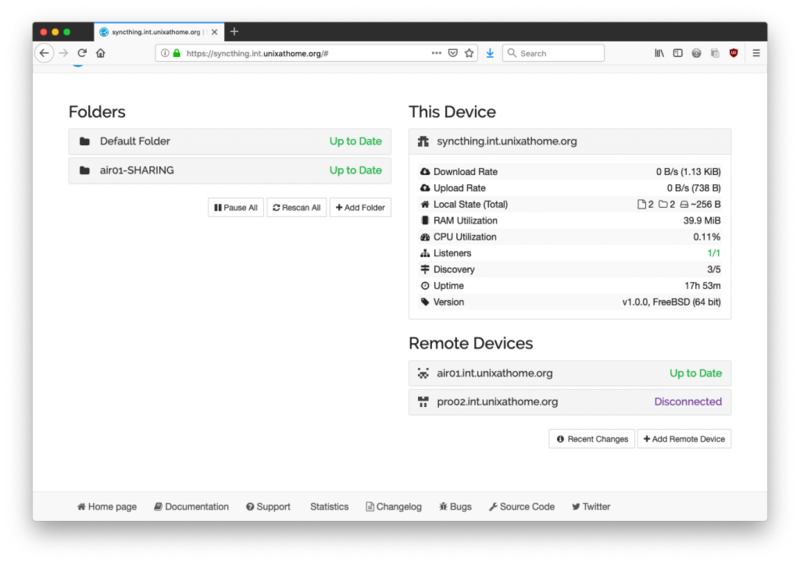 Via the web GUI, I clicked on settings and changed the Device Name to syncthing.int.unixathome.org, so it matched the DNS entry, as opposed to the host name. 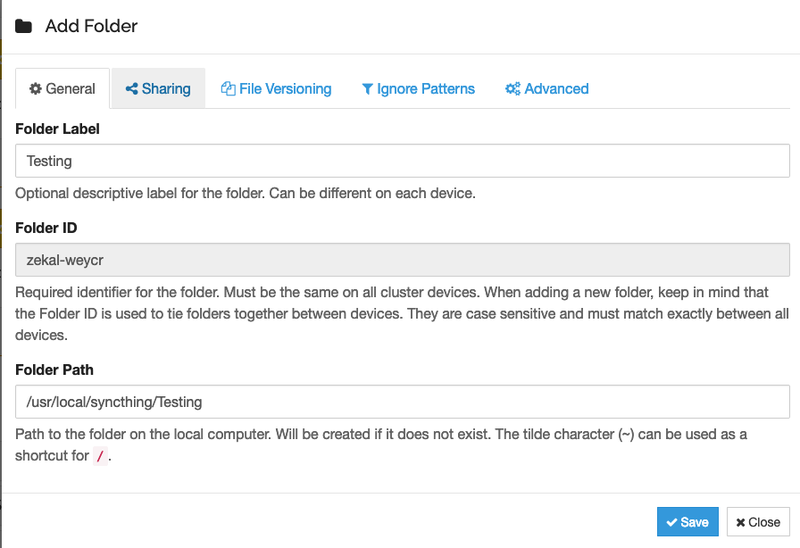 I also changed Default Folder Path from ~ to /usr/local/syncthing. You should also set the GUI Authentication User and GUI Authentication User values on the GUI tab. This controls access to your syncthing instance. I also disabled relays, via Actions | Advanced | Options | Relays Enabled. Relays are required unless all your systems have direct connections. All my hosts are on the same VPN so I disabled this. I was doing this on my MacBook Pro, and I had previously installed Syncthing. I clicked on +Add Remote Device. 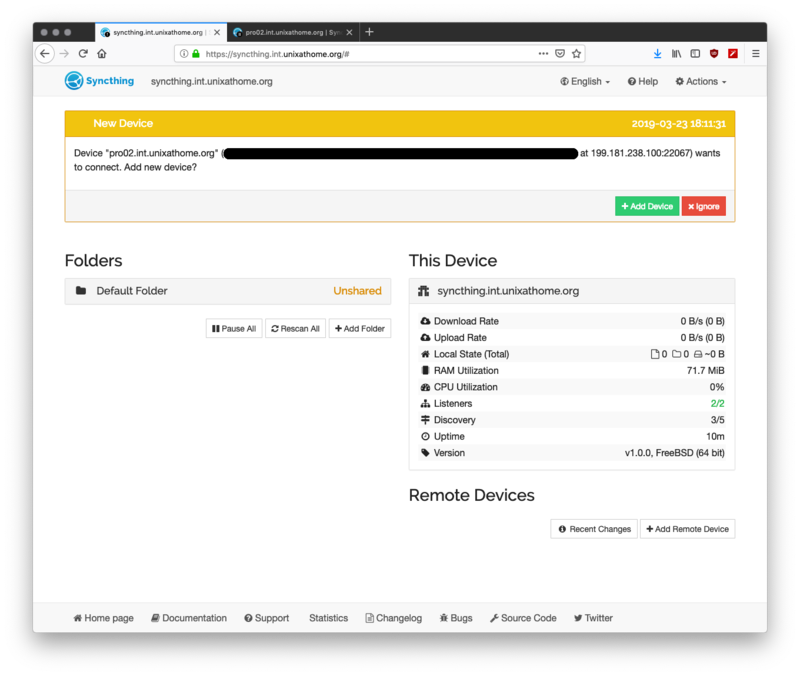 I pasted the device ID of my server, added the name of my server, and clicked on Save. That IP address is not the IP address of my laptop. It’s the relay server that my laptop is using. When took this screenshot, I had not yet disabled relays. This screen shot is actually from the next day, when I sat at a cafe typing up this part. From there, I had added a second latop, air01, and got it working. Please ignore this section if you are using relays. Instead of using relays, I want my hosts to connect directly to each other. This is possible because they are all on the same VPN. If firewalls/NAT/etc are involved, you might have more work to do before taking this step. On my server, I clicked on my laptop under Remote Devices, then on Edit. In the addresses field I put: tcp://air01-vpn-startpoint.int.unixathome.org:22000. I did this for all devices on all hosts. In the web GUI for the air01 laptop, I clicked on Add Folder. In Folder Label, I put Testing. In Folder Path, I put /Users/dan/Testing, but it defaulted to this value because of what I put in the Label field. On the Sharing tab, I checked the box beside my server name. Then I clicked on Save. My next goal: external file verisioning with zfs snapshots.